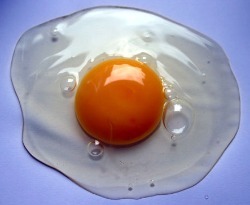 The protein in eggs are found in both the egg yolk and in the egg whites protein. I prefer eating raw eggs over cooked eggs especially when I'm in the need of a quick snack. However, it has been said that an egg whites protein called avidin can block the nutrient biotin under certain circumstances. What is biotin? Biotin is vitamin B7 and helps with the synthesis of fatty acids, amino acids, and glucose. What is Biotin & The Egg White Debate? Researchers have identified a substance in raw egg whites called Avidin that has the ability to bind together with biotin or B7 and prevent its absorption. 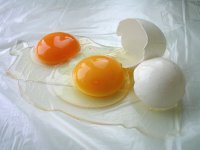 Still other scientists have identified the egg yolk as one of the most dense sources of biotin in your diet. And as long as you eat the biotin rich egg yolk along with the egg white, there is probably no risk of a biotin deficiency. However, this remains a debatable issue! Cooking your eggs will deactivate the Avidin and prevent this issue. Also, eating your eggs sunny side up would be a way of deactivating Avidin in the egg whites protein, and not damage all of the fragile protein in the egg yolk. The protein in eggs contain all the essential amino acids in the exact proportions required for optimal maintenance of your muscle tissue. Eggs have about 6 grams of protein per egg and almost all the protein in eggs gets used by your body. 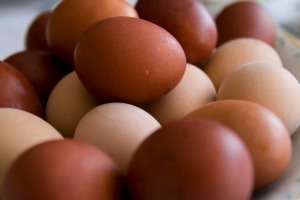 Eggs contain almost all B vitamins like niacin B3, riboflavin B2, biotin B7, choline (newest B vitamin), B6 and B12. Eggs are a great source of essential vitamins A, D and E.
And egg yolks are one of the foods that can actually contain vitamin D.
Eggs have minerals such as magnesium, calcium, potassium, phosphorous, selenium, iron, zinc, manganese, copper, and sulfur. Even though eggs have a good amount of cholesterol, eggs contain lecithin which markedly aids with the metabolism of cholesterol. The fat in eggs are about 1/3 saturated fat and the rest is mainly monounsaturated fat with a small % of polyunsaturated fat. Eating raw eggs may have many benefits as eggs contain essential nutrients for your brain, nerves, glands and hormones. 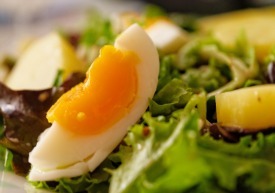 The protein in eggs contain sulfur amino acids that help to keep you young and eggs are a great source of glutathione. Both of these nutrients are often destroyed when you cook your eggs. One way to check for freshness is to put the egg up to your nose after you crack it open. If it smells off or funny, don't consume it. The odds are less than 1 in 30,000 chance of contracting salmonella poisoning and that's from commercial eggs. There is even less risk in organic eggs. It's important to get a supply of fresh eggs to avoid bad bacteria which may become an issue with eggs that aren't fresh. Pastured eggs are going to be the best and have more nutrients like vitamins A, D, E, and Omega 3 fatty acids than caged chicken eggs. 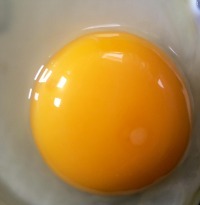 And the more orange the egg yolk - the more vitamin A or nutrient dense the egg. Chickens need to be outdoors to get their share of vitamin D from the sun and they also will do much better with getting protein from bugs and worms. Whatever you do, you don't want eggs from chickens fed soy or contaminated feed.